In my Spring Break Recap post I mentioned going to a petting zoo and that I wanted to do a post about the adventure and that's what I am sharing with you today! The petting zoo was actually an alligator petting zoo that had other animals as well. 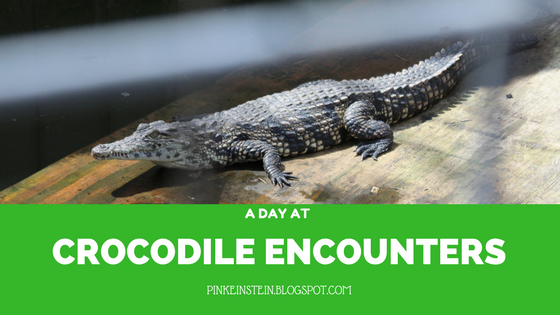 The place was called Crocodile Encounters and it's near Houston. I must say that it was a bit sketchy (it was in some one's backyard!!) and I was a little bit nervous going in but it was a ton of fun! When you get there you enter through the gift shop where you can buy crocodile food that you can throw to them and lettuce you can feed to all of the other animals so we bought some to feed the animals. We didn't spend but a couple of hours there because this pale girl was quickly burning and I didn't want to be the color of a lobster the next day. And don't forget you can click on the pictures to view them larger! They had miniature pigs and of course I was immediately attracted to them and I spent most of my time petting them, feeding them, and talking to them. I really wanted to take them all home and give them a bath (they were very dirty) and give them lots of treats. I loved this pig the most. The pigs were in a round pen in the middle of the walk way to see the different alligators and he would follow me around the fence! I wanted to stuff him in my tiny purse and bring him home. Next we went to see the lemurs! I wanted to bring them home too! They were so sweet! When they saw us come near their cage they hopped on the fence and stuck their little hands out for a piece of lettuce. Next we went and saw this guy. I have no clue what kind of animal he is. He was like a dog, he let me pet him and he licked my hands. If you haven't noticed yet I love animals and would bring them all home with me if our car was big enough! There was a tortoise yard with about 30 large tortoises that you could play with and feed. They had a variety of different crocodiles and alligators that you could throw food to and watch them eat it like prey. I don't know what these guys are but they acted just like my cows do when I feed them, they licked me and let me love on them. That thing laying down is a kangaroo. They had four kangaroos and they were all antisocial so we didn't feed them and I couldn't get a good picture. We went and saw the turtles on our way out. They are alligator snapping turtles and I'm not sure if I ever posted about him but I used to have a baby alligator snapping turtle named Richard. So that was my day at Crocodile Encounters! It was a ton of fun and I hope you enjoyed reading about the day! That looks like such a fun petting zoo!! I love the pictures of the tortoises and lemurs! It was a ton of fun! The tortoises were so cool and I wanted to bring the lemurs home!